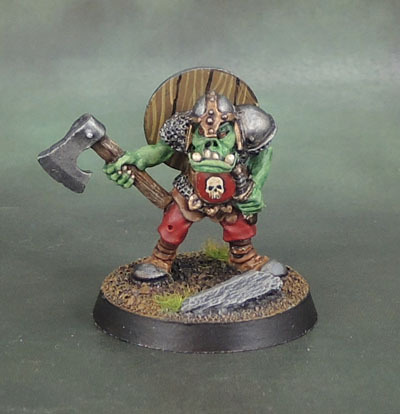 Orc1 Warrior Orc/Orc Champion (Kev Adams, 1987-88 or thereabouts) Part 1. | Azazel's Bitz Box. 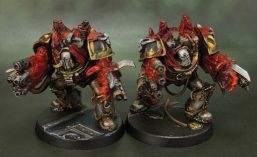 This entry was posted in Age of Sigmar, Orc and Goblin Army, Warhammer Fantasy - 9th Age and tagged Classic Citadel Miniatures, kev adams, Oldhammer, Orcs and Goblins, Warhammer, WHFB. Bookmark the permalink. That shield does look good, mind you! If I’d painted that I’d be more than pleased with it! Love the shield design mate. Hisbface doesn’t look too bad to my eye. What’s the issue with it? Also, how did you do/make the rock on the base? The problem with the face is the slightly dodgy sculpt. When I find his mate and photograph him, I’ll do a side shot to show you. The rock is a small piece of slate. I got a couple of tiles a few years ago and smashed them down. I’ve only used less than half of the tiles, but naturally I need to restock my little tub of basing slate now and I have no idea where it is. Nice one dude – that shield rocks! Nice Orc, he has a lot of personality! Thanks Mark. 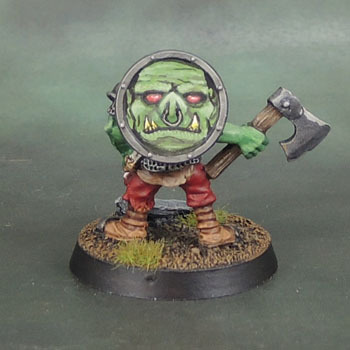 Not my favourite greenskin, but the old models do have a lot of personality!